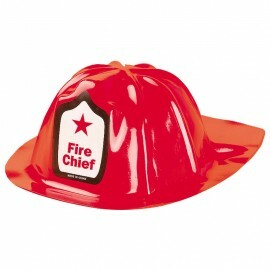 Six Firefighter party hats - spacekids - space toys, dressing up costumes, kids spacesuits, astronaut food, cool space stuff! Styled to look like a US Firefighter's helmet, these little hats are great fun for younger children, as party hats or favours. Six helmets included. Being made of thin lightweight plastic they are ideal for parties, but for sustained play we would recommend one of our more substantial firefighter helmets.